My aunt has always made the cranberry sauce for Thanksgiving. Ever since I was three she has made a reduced sugar version because my brother had recently been diagnosed with insulin dependent diabetes. 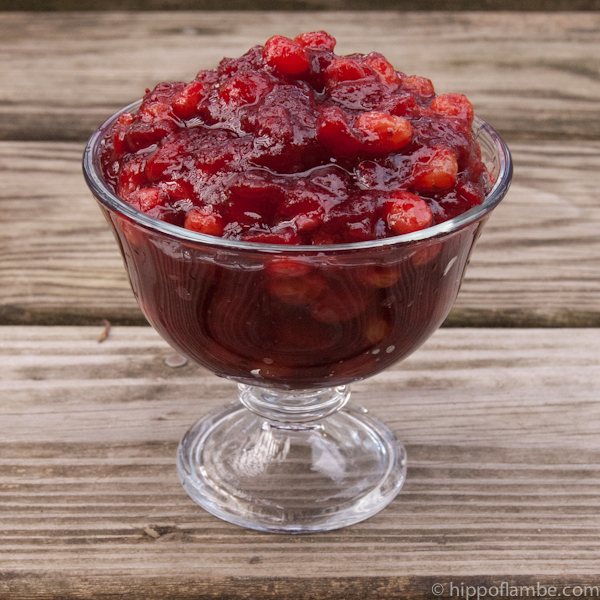 Her cranberry sauce is still sweet but it retains some of the tartness of the cranberries. 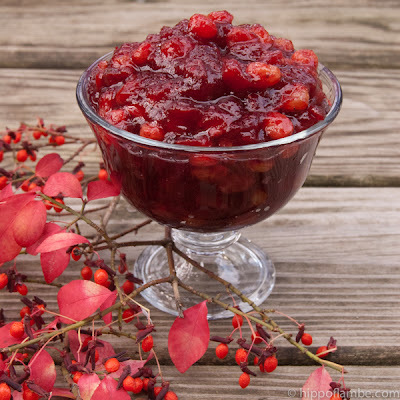 When you eat it paired with turkey you understand why cranberry sauce traditionally accompanies turkey, the bright tartness really balances the flavor of the meat. I have tried on several occasions to recreate her recipe. The first time she gave me a very general list of what was in it. The sauce I made that time was not sweet or tart enough. Last year I made the cranberry sauce with her, watching carefully as she pulled out her old newspaper clipping and adjusted the recipe to our tastes. I tried again to recreate her version, although I did not have the original recipe as a guide. In the end I think I did not have the right type of citrus, or I was just too heavy handed with it. Whatever the reason, my latest attempt was too orangey and not balanced. So I went a different route, finally trying a recipe a friend had mentioned years ago. I lowered the sugar, replacing it with golden raisins, a trick I picked up from making cranberry sauce with my aunt. The finished sauce is complex, tart enough to balance the turkey, but after a day or so sweet enough that I loved it spread on a crepe. If you make it now you can freeze it until Thanksgiving. Just pull it out to defrost one to two days before the big day. This sauce can be made weeks or months ahead of time and frozen until 1 to 2 days before serving. When it is first cooked it will still be very tart, as it sits the flavors blend and the raisins impart more sweetness to the sauce. Do not add more sugar until it has rested for several days. I have made it with lemon and also with tangerines, clementines and tangelos would also be good. Combine all the ingredients in a medium pan and simmer until the berries have all burst and the mixture has gelled. Allow to cool before placing in a container in the refrigerator, or freezer for longer term storage. Alternatively you can can it. Follow the canning directions here. This cranberry sauce looks lovely and must have a very couplex flavor. 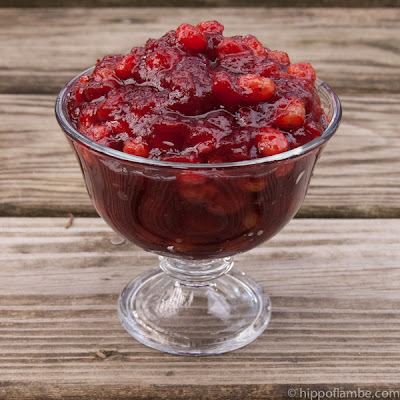 I wish I could try it but I am totally completely hooked on Eating Well's cranberry-raspberry-ginger relish which I make it every year for the holiday and finish up with Greek yogurt afterwards. Maybe I could splurge and make both?